Mix sugar, flour, cocoa, baking powder, baking soda and salt. Add the eggs, milk, oil and vanilla. (If using mixer, beat on medium about 2 min.) Stir in boiling water. Pour into large greased & floured bundt pan. Be careful not to overfill. Place chocolate in glass baking pan. Heat gently in microwave 10 seconds, and 5 seconds thereafter until melted. Do not overheat. Stir in cream. Cook 40 more seconds and stir or until thickened. Stir in powdered sugar and vanilla until smooth. Drizzle over cake. Let stand until set. 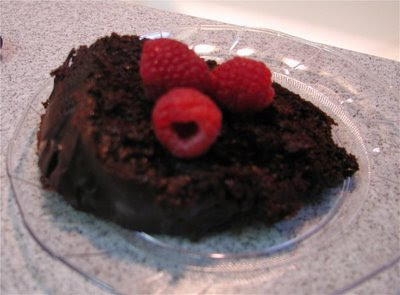 Top with fresh raspberries if desired.